Peter Martin: How can you tell things are getting more better here than there? Our iPods cost more. How can you tell things are getting more better here than there? Our iPods cost more. What a difference an improving economy makes. 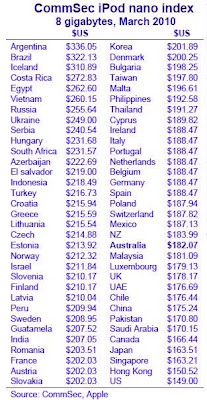 Before Christmas heavy discounting made Australia the cheapest place in the world in which to buy iPods. Now we've slipped to just the 14th cheapest, and have become about the most pricey nation in the English-speaking world, out pricing the US, Canada, and the UK. All iPods are made in China, and in theory should all be sold at the same price at prevailing exchange rates after taking into account transport costs. But discounting and price gouging can change that. 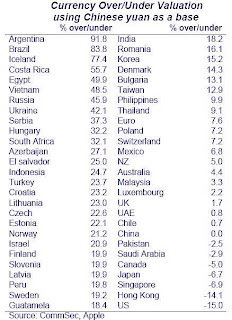 Like the Economist magazine's Big Mac Index before it the Commonwealth Securities iPod index compares worldwide prices in order to get an idea of which economies are weak enough to need discounting and which are so strong retailers can afford to gouge. The updated index suggests Australia has moved from weak to neutral territory with retailers in the US, Canada and the UK remaining positively frail. "Just before Christmas, Myer slashed the price of the top-selling 8 gigabite iPod nano from $199 to $159. When converted to US dollars it meant Australian consumers could buy here $10 cheaper than in the US and $11 cheaper than in Hong Kong," said CommSec economist Craig James. "But right now Australian tourists could save $21 shopping in Singapore, $35 in Hong Kong." The less-generous approach to discounting reflects improved retail fortunes... The Bureau of Statistics found consumers shunned department stores in the lead-up to Christmas spending an extraordinary 3 per cent less than the December before, the first time in almost two decades one December hadn't improved on another. In January department store sales rebounded a seasonally-adjusted 7 per cent. Like the Big Mac Index, the iPod index can also be used to indicate whether a currency is over or under valued. With the iPod selling for only US$149 in the United States but US$175 in China, the index suggests the US dollar is 15 per cent undervalued against the Chinese yuan. Put another way, it suggests points to pressure for China to devalue the yuan. But Australia is one of the countries least out of whack against the yuan. The iPod index suggests we are only 4 per cent overvalued. "Looking at the index it is hard to conclude that the Aussie dollar is either significantly under or over-valued against China," said Mr James. "We have relatively high interest rates and a strong economy while benefiting from strong Chinese demand for our resources."
. What's a Big Mac worth?